With an annual budget of $420 million, New York State has one of the nation’s most generous tax credit programs for film and television production. And with New York City providing a tantalizing backstory of finance, fashion, art and 24/7 dynamics, it isn’t surprising production after production originate in the state. Not only do film and TV productions benefit from the generous incentives, New York State’s economy receives a sizeable boost as well. According to the Empire State Development office’s quarterly reports for 2017, the 158 film and television projects that were issued credits that year contributed approximately $3 billion to New York State’s economy and provided thousands of full-time industry related jobs. In the same year, 72 postproduction projects spent $133 million and created 2,025 postproduction related jobs. 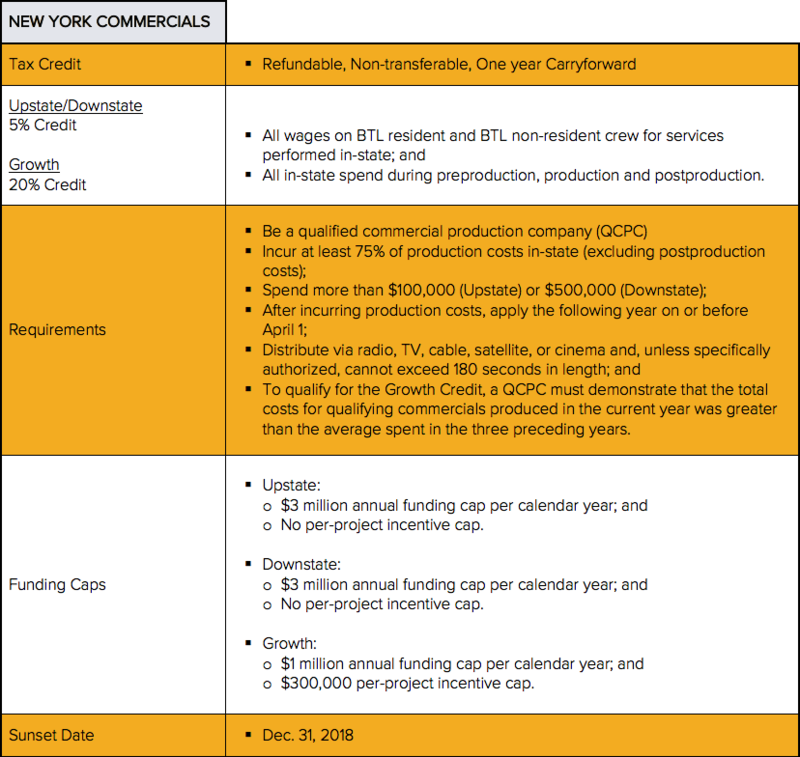 The New York Film Tax Credit Program includes three types of incentives: Production, Postproduction Only (PPO) and Commercials. 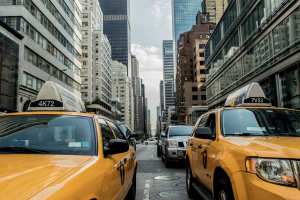 New York’s Production and PPO incentives offer a base credit of 30 percent for all qualified spend (including compensation for below-the-line crew) incurred in New York State during preproduction, production and postproduction. Because New York does not have a minimum spend requirement, productions of any size can benefit from the tax credit program. 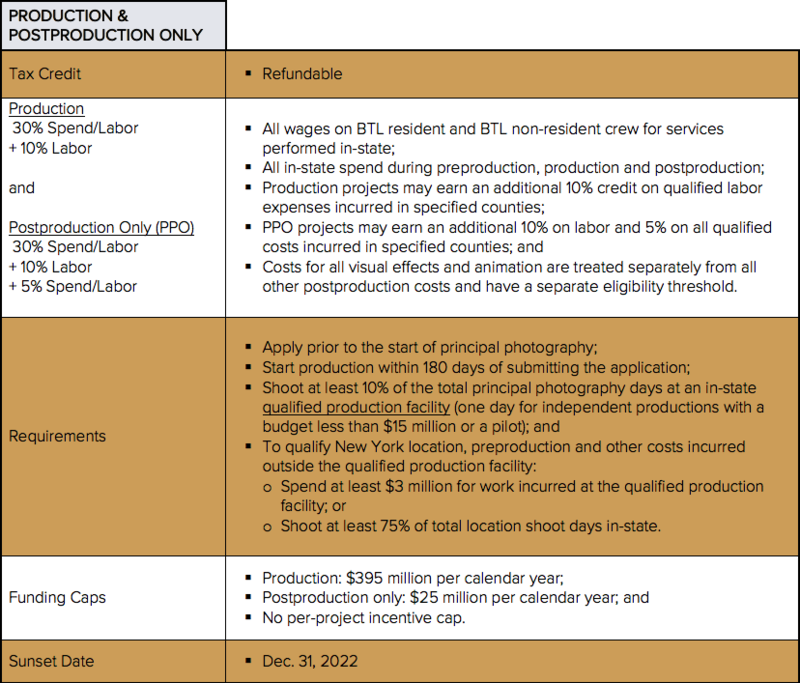 Projects filmed outside New York may still apply to have their postproduction costs qualify for the PPO incentive program. Taking the project out of the city? In addition to the 30 percent base credit, an additional 10 percent may be earned on all qualified labor expenditures incurred when the production films in select counties in New York. The PPO incentive offers the same additional 10 percent, but also offers an additional five percent on all qualified costs, including labor (in select counties). For the period 2015-2022, a maximum of $5 million per year can be allocated for the additional 10 percent credit and there is a minimum budget requirement of more than $500,000 to qualify. New York offers a five percent commercials tax credit, which is available to qualified commercial production companies (QCPCs) shooting downstate and upstate. Commercial projects must meet a minimum spend requirement of $500,000 (downstate) and $100,000 (upstate). Additionally, a 20 percent “growth credit” exists for QCPCs. More details can be found in the Commercials table below. Projects earning a credit of $1 million or more (but less than $5 million) will be paid out in equal installments over a two-year period, while credits of $5 million or more will be paid out in equal installments over a three-year period. Projects claiming a credit of less than $1 million will be refunded in a single payment. PPO credits require further consideration since the disbursement schedule differs from the production credit schedule. For PPO credits, only 50 percent of the excess credit for any particular year may be refunded. The amount of the credit not refunded is carried over and claimed on the subsequent year’s tax return. A project with credits less than $1 million will be refunded in equal installments over a two-year period, credits of $1 million or more (but less than $5 million) will be paid out in varying amounts over a three-year period and credits of $5 million or more will be paid out in varying amounts over a four-year period. This may impact your production company’s cash flow, so make sure your finance plan accounts for this disbursement schedule. For further details on the New York Film Production Tax Credit Program, please visit www.esd.ny.gov/new-york-state-film-tax-credit-program-production.